Happy Monday! I'm finally getting around to bind and finish a few quilts that have been sitting around! I sent off some lingering works-in-progress to Melissa of Sew Shabby Quilting this past Spring knowing I would never get to them myself. It was an amazing feeling to have ZERO quilt tops waiting to be quilted. Of course it didn't last long, but for a brief moment it was the truth, and it was awesome! I'm hoping to keep them from piling up again! I've decided to call this quilt Sticks and Stones. The first name that came to mind was "Wonky Scrappy Pluses", but I'm trying to be a little more creative in the naming department! The strips remind me of some painted sticks I've seen on Pinterest. The quilting sort of mimics stones a bit, so there we go. That's the story! I started these blocks at the very first Camp Stitchalot in December 2012! I can't believe it has been that long ago. 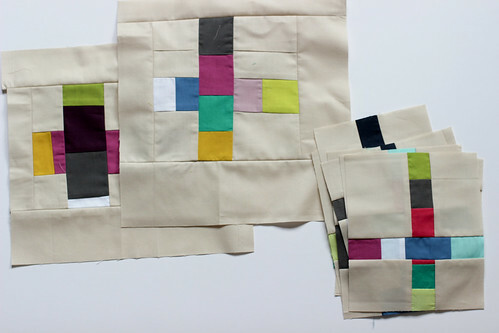 I made these during an Improv Piecing class taught by Heather Jones. I decided to stretch myself and use only solids for these blocks. All the solids are Pure Elements by Art Gallery Fabrics. The background is Sandstone! 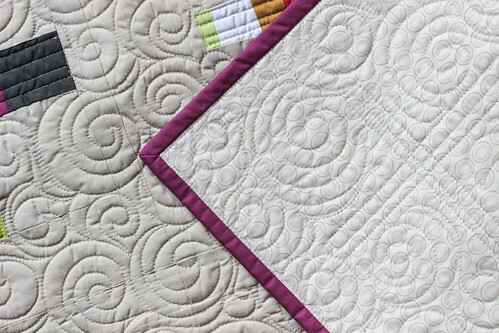 Confession time: I am afraid of quilting with solids. I love prints, so working with just solids was weird! There is no place to hide my quilting mistakes! I had literally no idea how to quilt this, and was not keen on filling in all that negative space. Enter Melissa! I had her do custom quilting, whatever struck her fancy. I love what she did with it! The contrast between the strips and the background is so cool! I'm excited to find a place in our apartment to hang this one up. It's been a long time coming, it feels good to finish it! I bound the quilt in one of my favorite Pure Elements, Verve Violet. It's pretty excellent if you ask me! 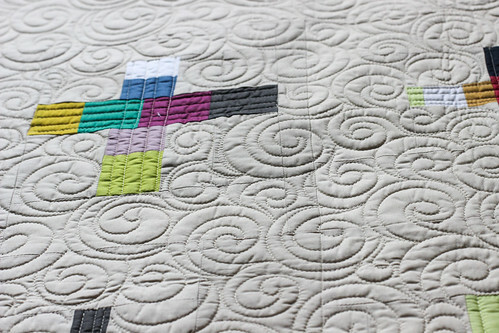 I love the way this was quilted! Absolutely beautiful and it does tie in well with the theme!!! The Verve Violet is absolutely GORGEOUS! Yay you! I've not jumped on the wonky band wagon yet, but I admire those who bravely step outside their comfort zone. 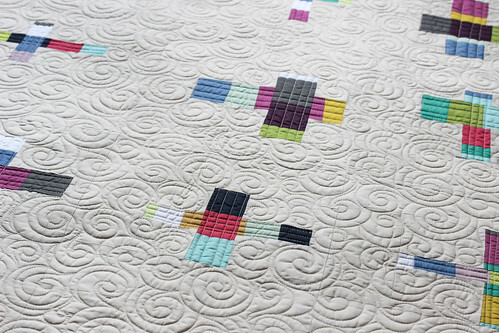 i cannot even imagine this quilt being quilted any other way. Beautiful! Just beautiful and so modern! Is there a tute you know of for making the blocks? 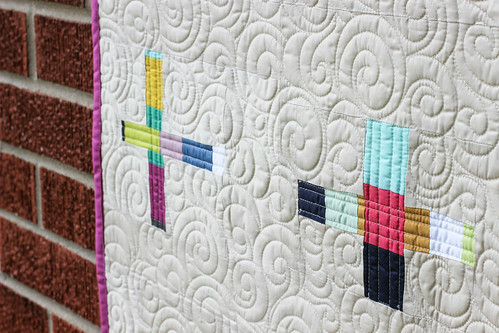 I really love this quilt and simply must have one like it! ROFLOL Thanks. Love all those little punches of colour against that yummy Sandstone. It does take a little time to get used to those wide open spaces created by solids in patterns like this one. 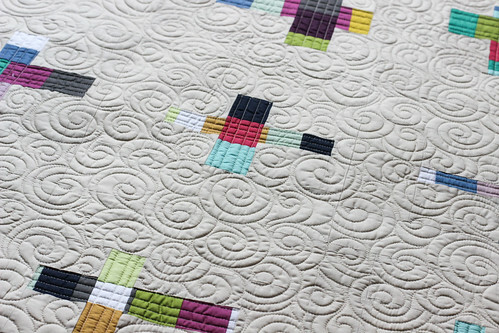 The quilting pattern that was chosen suits it beautifully. Lovely work! 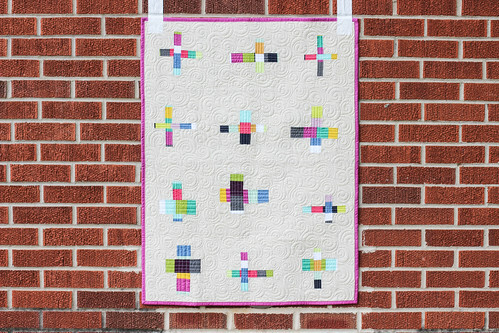 I'm with you on all solids and then machine quilting. All the open areas along with the lack of print intimidates me when it comes time to quilt. Yours turned out great. Yes, the violet was a great and surprising choice. This is beautiful! When I look at it, I see airplanes and swirly clouds, perfect for a boys room! But I do have two young boys who love airplanes.